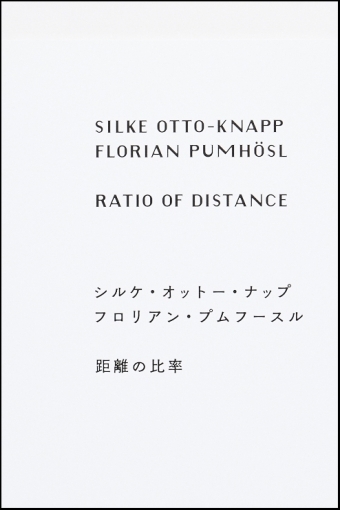 Published on the ocassion of the exhibition "Silke Otto-Knapp & Florian Pumhösl: Ratio of Distance” at Taka Ishii Gallery in 2014. Otto-Knapp and Pumhösl had a parallel solo exhibition at Galerie Daniel Buchholz, Cologne in 2008. They also exhibited together at the Arnold Schönberg Center in Vienna in the exhibition “art is: new art” in 2013. This is the first time they are collaborating on a two-person exhibition with new work formalizing their ongoing dialogue. Text by Tom McDonough.